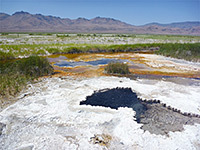 Although in no way part of the geographical Southwest, Oregon contains extensions of some of the landscapes in California and Nevada to the south - the Great Basin Desert occupies the southeast third of the state, the Cascade Range extends from north California all the way into Washington, and the steep coastal mountains of California's redwood forests continue the full length of the Pacific shoreline in Oregon, looking down on countless tiny islands and secluded beaches. The population is very much concentrated in Portland and in smaller cities along the I-5 corridor, leaving the remainder of Oregon very lightly settled, and many areas have relatively few paved roads, especially in the desert southeast. Huge stretches are public land, either managed by the BLM or part of national forests, so there are endless opportunities for exploring and for primitive camping. 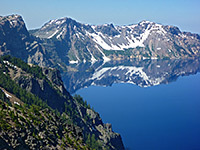 The National Park Service operate only three landscape-based preserves (in addition to a few historic sites): Crater Lake, Oregon Caves and John Day Fossil Beds, but many other places are protected as state parks, state beaches, state forests and wilderness areas, and there are also two large USFS-owned parks, Oregon Dunes NRA and Newberry National Volcanic Monument. In the west, the Pacific coastline of Oregon stretches for 310 miles, from the California border to the Columbia River adjoining Washington, and all has a similar appearance - mostly rocky, either sheer cliffs or sloping hillsides, but with many beautiful beaches, the majority little visited owing to the generally cool weather conditions that prevail even in summer, and the often difficult access. One special feature are the thousands of offshore rocks, found all the way along the coast, many eroded by wind and waves into arches, caves, spires and other photogenic formations; all are protected as Oregon Islands National Wildlife Refuge. 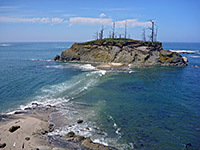 The southern section is most scenic, from Brookings to Coos Bay. 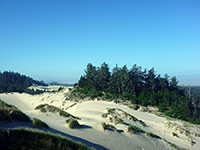 The Oregon Dunes region is an exception to the predominantly rocky shores, as for 40 miles the shore is formed of sand, partly grass and tree-covered, with marshes, creeks and lagoons a little way inland. This is managed by the USFS as a National Recreation Area, and has many visitor facilities yet even here much of the land is still wild and not often explored, since the coastal highway US 101 runs inland, several miles from the coast. Nearly all the many state preserves along other parts of the coast are free to enter, have little or no development, and have spectacular scenery. Moving inland, the Coast Range also spans most of the state, from north to south - rolling, densely wooded hills rising to 4,000 feet, split by innumerable branched, steep-sided valleys and crossed only by a dozen or so main roads. Here are found a few state parks and scenic drives, but the majority is not especially interesting. Unlike the coastal forests of north California the trees are regular fir and pine; in Oregon, giant redwoods are found only in the far south near Brookings. The northern half of the Coast Range slopes down to the Willamette River valley, while in the south the hills merge with the higher, more isolated Cascade Range of active and dormant volcanoes. 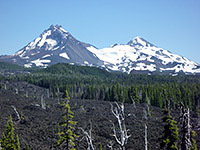 Around 40 major volcanic summits have been identified, of which five are especially prominent (Crater Lake, Newberry Volcano, Three Sisters, Mount Jefferson and Mount Hood). 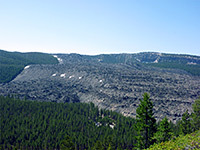 The first is a national park, Oregon's premier natural attraction, the second is part of a fascinating USFS preserve that also contains lava caves, cinder cones, craters, lava flows and other volcanic phenomena, while the other three are on national forest land. Being higher in elevation and further north in location, they carry glaciers and extensive seasonal snow fields around the summits, but the foothills are easily explored in summer. The eastern half of Oregon is the least well known region and has fewer obvious attractions. 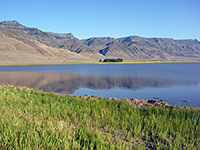 The southern portion is mostly desert, in the rain shadow of the Cascades, and features vast, sparsely-grassed plains, separated by isolated treeless mountains, but all is still scenic, and the land harbors many small, interesting sites such as hot springs, dry lakes, wetlands, volcanic remains, deep narrow canyons (especially the Owyhee River and its tributaries), and historical relics. 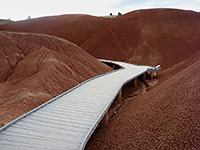 To the north, the desert gradually gives way to hillier, moister landscapes, also with scattered volcanic formations and exposed sedimentary rocks where many fossils have been unearthed; three locations are protected in the separate units of John Day Fossil Beds National Monument (Sheep Rock, Painted Hills, Clarno). The elevation increases further in the far northeast of Oregon, which has peaks over 10,000 feet in the Eagle Cap Wilderness, near Hells Canyon and the border with Idaho.